Offered as part of the General Catalog in perfume only. Fires in the Night quickly jumped to my short list of favorite SS fragrances. The original Edge of the Night base is readily detectable, but is layered with utterly delicious notes of orange, amber, clove, and ginger. The wood smoke is detectable but not overpowering. In a way, Fires is a more complex and mature version of Astral Temple, though to my nose the amber notes are not as dominant. I far prefer Fires to Astral Temple, though the two would also layer nicely together with Astral Temple adding a boost to the orange, spice, and amber notes already present in Fires. What an interesting fragrance and combination of notes! I have been waiting until mid-winter to do a full testing of this fragrance because the range of notes described stuck me as cold weather ones. I guess I should start with acknowledging that, like a number of other Solstice offerings, Fires in the Night has a dual aspect to it and rather a lot going on. It opens with a wonderful familiarity of warmth and depth that this house does so well. The cinnamon is the first note that I was conscious of, but underneath there are woods, vanillas and a glorious musk that provide a superb support. As the fragrance develops, the cinnamon recedes a little and other spices make their debut. There is a hint of cloves to provide a rich warmth and a definite ginger to add to the "fire". I also detect the lavender with its hint of resin. An dried orange peel peeps through next and I am reminded in culinary terms of Chinese Red stock cooking used in braising meats. They too have an extraordinary number of ingredients and depth just as in Fires in the Night. If there was a black pepper used it would not surprise me, but I may be getting confused by a combination of lavender and star anise for that note. 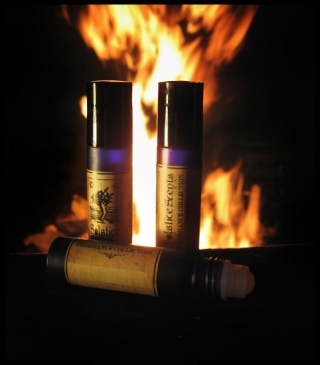 The Patchouli works in harmony with the musk all the time sitting underneath the other ingredients. The whole time I am saying to myself "I know this scent" but of course it is the individual notes that I recognise, not the unique combination. There is a lovely incense vibe to this fragrance which is a delight. I assume that is the "Night" part. Despite this however, the musk ensures that this is a very personal skin friendly fragrance which has a definite romantic, soft side as well. This reminds me of pleasant memories of campfires and cool fall nights. If you like Smokey Mallow or even Shoikon Grove, give this a whirl. Alas, although I enjoy this intellectually and emotionally, smokey scents aren't in my wheelhouse as they get a little scratchy in my throat. None of the Night fragrances that I've tried so far have really worked out well on my skin. This smells like lime and ginger candy, baby powder, and lots of really harsh, strong woodsmoke. The woodsmoke gets stronger in the drydown, and it's too much for me. I'm really torn about this one. I'm an amber hound, and the amber in this is lovely and dark; I also love the bergamot and orange notes which are most prominent on my skin on first application, but my skin amps the star anise (in the Edge of Night base) to high heaven. The anise together with cinnamon and ginger makes this perfume overwhelmingly reminiscent of chinese five spice on my skin. I love it in cooking but in a perfume it makes me uneasy and even a little queasy every time I get a whiff of it, it just makes me want to wash it off right away .